This site is all about evolutionary changes, health from the ancient/paleo perspective, and how our genes are imprinted to adapt and survive (whether we want to or not). Chronically high insulin (from high refined carbs, from gluten/food-stressors, hypothyroidism, low progesterone, adrenal dysfunction, metal toxicity, endocrine disruptors, etc) raises insulin resistance in our organs which can lead to increased small dense LDL, high TG and low HDLs. A cascade of further hormone changes and vascular adjustments occurs. Vascular blood pressure may increase. Pre-clinical hypertension can develop and eventually atherosclerosis ('scarring' in affected vessels) and diabetes (inappropriate and chronically elevated blood glucoses). Later, the natural progression of this hormonal storm of insulin dysfunction includes diabetes complications or target organs (kidney, eye, nerve damage), heart failure and heart events (revascularization surgery, heart attack, angina, sudden death, bypass and/or stent placements). Lamarche B et al wrote an editorial in 1996 (see Ref 1) and NEJM (N Engl J Med. 1996 Apr 11;334(15):952-7.) and wrote that the higher quintiles of insulin were highly associated with higher rates of atherosclerosis and heart events in the Quebec Cardiovascular trial. 67 pmol/L (= 9.3 mIU/L) was used as odds ratio = 1.0 (it's still high IMHO; goal = 4 mIU/L in other words less than ~28 pmol/L). See above bar graph (Ref 1). Convert pmol/L by dividing 7.175 for mIU/L. More about 'normal' fasting insulin HERE. The Lamarche B et al state "For example, an 11-fold increase in ischaemic heart disease [IHD] risk was noted among men with both hyperinsulinaemia and elevated apo B levels, these two metabolic abnormalities being common among individuals with abdominal obesity, especially when associated with high levels of visceral (intra-abdominal) adipose tissue. What is Visceral Adipose Tissue? Do you have any? I do. On my belly. In my head... from the ravages of the high carb S.A.D., high omega-6 intoxification, high trans-fat/F*CK-TOSE intake from my childhood/teens/early-20s-30s (OK. a long time, most of my life), sedentary lifestyle, undiagnosed Hashimoto's autoimmune hypothyroidism, stress of LIFE, et cetera. Fatty calcified livers (e.g. NASH, fatty liver, NAFLD, foie gras) ? Fatty calcified atherosclerotic plaque in arteries: Renal, Carotid, Coronary, Peripheral, PENILE (e.g. ***Erectile Dysfunction BABY -- you do not have a Viagra-deficiency) ? Fatty calcified adrenal glands ? Fatty calcified pineal glands (e.g. insomnia) ? Fatty calcified pancreas glands (e.g. metabolic syndrome, diabetes) ? Fatty calcified gallbladders (e.g. GERD, dyspepsia, heartburn, gas/bloating)? Fatty calcified ovaries/ fallopian tubes/ fibroids/endometriosis/ PCOS? Many benefits improve on lower carb Paleo/ancestral diets. Why? It works and best matches our DNA genetic expression. Lamarche B et al in Quebec, Canada have elucidated a few things about insulin, e.g. chronically high insulin and insulin resistance (IR). Insulin and IR are related to high TG, low HDL, and high dense LDL and high visceral fat and high belly circumferences. MOREOVER... More morbidity. More mortality. --Ref 5: Beyond LDL... total-LDL is meaningless, only sdLDL really matters. Conventional cholesterol panels and LDL are CR*P. The lipoproteins need to be fractionated by size and buoyancy for a progressive, accurate and sensitive reliable metric. 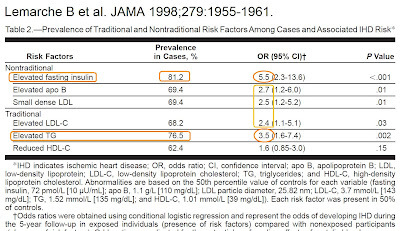 --Ref 8: 13 years later after the Quebec Cardiovascular STUDY... only thing that matters is sdLDL... the small dense LDL subfraction... related to death and cardiovascular events. Large LDL do not matter, the authors concluded. In fact many experts believe large buoyant LDL are anti-atherogenic and antioxidants. I highly agree. The larger, the PHATTER, the merrier. Why is eating a (semi) unrefined, ancient-styled diet the way to go for reversal of chronic diseases and longevity? No simple answers but Paleo lowers chronic hyperinsulinemia. Frassetto et al at the University of California, San Francisco recently published a 10-day trial comparing metabolic changes and hypertension improvements on the paleolithic diet. Paleo controls insulin better than Zone 40/30/30 and of course WAY way better than the S.A.D. HOMA is a measurement of insulin resistance. 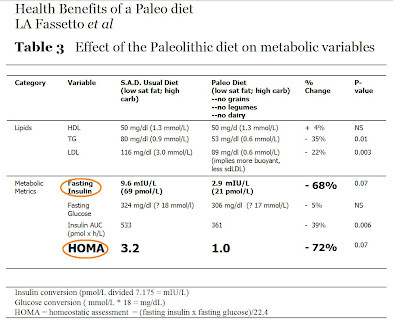 Paleo (despite being high carb and low sat fat) achieved a 72% reduction in insulin resistance, HOMA (p=0.07). This was a high carb, low glycemic index with carbohydrates at ~~ 200 g/day diet. It was matched to the SAD diet. What an ingenius diet trial! Lower carb of course may be preferred for those with significant insulin resistance and fat-burning challenges. Higher sat fat, IDEAL in my opinion. In this trial (see below Table 3), in terms of lipoproteins, Trigs were still high (e.g. excessive dietary carbs in the form of honey, pineapple, carrot juice, melon and excessive n-6 mayo) and HDLs still marginally suboptimal (e.g. saturated fat deficiency). HDLs often mirror the LDL particle size. The premise is to alter the neolithic, post-agriculture diet macronutrients and micronutrients (glycemic load, glycemic index, gluten, lectins/phytic acid, legumes and dairy). Amazing insulin changes happen. Is this what our genes were designed for 2.5 million years to do? We don't live in a land of honey, sweets and fruit. We are meant to starve sporadically, lift heavy things occasionally, move intensely intermittently, relax daily, play, hug, make babies (umm.. do I need to elaborate?) and eat foods that our ancestors thrived on. Complying to the genetic programming and optimizing where the genes and genetic expression are screwed up will provide a reprieve in these neolithic times IMHO. Compared with the 'usual diet' (e.g. standard American diet), the Paleolithic Hunter-Gatherer diets controlled insulin, HOMA (insulin resistance) better than the usual S.A.D. in overweight men and women ages 18+ years old. These results are nothing short of phenomenal in a Big Pharma-dominated medicine tradition. No drug replicates these results, especially in only 7-10 days. No drugs (except glandular, hormonal or omega-3 fish oil pharmaceuticals) are disease reversing; they serve only to band-aid and hide in my experience. In modern, conventionally-schooled medicine, no cause or pathophysiology is assigned to the disease known as hypertension. Apparently the role of insulin and refined dietary carbohydrates (or other endocrine disrupting factors) are not considered. Conventional weight loss, diet ('low fat') and exercise are always prescribed yet rarely in my observations is hypertension stopped or reversed by these means successfully and long-term. Why? --Dr. Mike Eades MD discussed HERE. --Matt Metzgar recently discussed as well HERE. --Even Lyle discussed briefly HERE. --My bud master Chris @conditionresearch.com which is one website that lead to my rapid health reveral discusses naturally of course HERE. --My bud O Primitivo discusses HERE in Portuguese. --And even Dr. Davis discusses HERE linking back to the inimitable, matchless Protein Power Dr. Mike Eades. Aging and oncogenesis are related to insulin. Brewer (Ref #10) has explained how aging is related to insulin and insulin resistance. What degrades mitochondrial efficiency? In the modern Western diet (now currently imported globally to Europe and China along with Western diseases), high refined carbs, refined fructose, industrial pesticides, toxic heavy metals, and refined vegetable oils brimming with omega-6 PUFAs are the typical culprits adding to the insulin resistance and hyperinsulinemia burden. Chronically elevated blood insulin leads to an overall fattening effect which can calcify and harden the liver, the arteries, and many other organs (thyroid, adrenals, arteries, endothelium, vasculature, pancreas, gallbladder, brain etc). Brewer describes "This metabolic shift is epigenetically enforced, as is insulin resistance to reduce mitochondrial turnover. The low mitochondrial capacity for efficient production of energy reinforces a downward spiral of more sedentary behavior leading to accelerated aging, increased organ failure with stress, impaired immune and vascular failures and brain aging. Several steps in the pathway are amenable to reversal for exit from the vicious cycle of EORS. Examples from our work in the aging rodent brain as well as other aging models are provided." Low carbohydrate diet (15%) in rodents extends longevity and minimizes tumour growth compared with S.A.D. low fat, high carb diet. See Ref #12. Resistance training reverses aging. See Ref #13. Burn baby burn. 1. Risk factors for ischaemic heart disease: is it time to measure insulin? Després JP, Lamarche B, Mauriège P, Cantin B, Lupien PJ, Dagenais GR. Eur Heart J. 1996 Oct;17(10):1453-4. 2. Fasting insulin and apolipoprotein B levels and low-density lipoprotein particle size as risk factors for ischemic heart disease. Lamarche B, Tchernof A, Mauriège P, Cantin B, Dagenais GR, Lupien PJ, Després JP. 3. Small, dense low-density lipoprotein particles as a predictor of the risk of ischemic heart disease in men. Prospective results from the Québec Cardiovascular Study. Lamarche B, Tchernof A, Moorjani S, Cantin B, Dagenais GR, Lupien PJ, Després JP. 4. Associations of HDL2 and HDL3 subfractions with ischemic heart disease in men. Prospective results from the Québec Cardiovascular Study. Lamarche B, Moorjani S, Cantin B, Dagenais GR, Lupien PJ, Després JP. Arterioscler Thromb Vasc Biol. 1997 Jun;17(6):1098-105. 5. Atherosclerosis prevention for the next decade: risk assessment beyond low density lipoprotein cholesterol. Can J Cardiol. 1998 Jun;14(6):841-51. Review. 6. 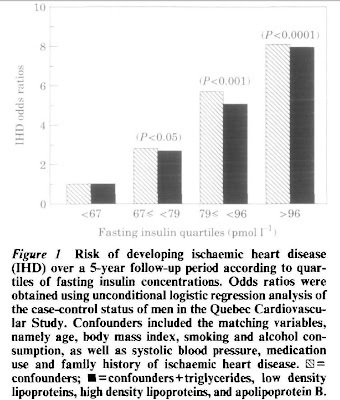 Visceral obesity and the risk of ischaemic heart disease: insights from the Québec Cardiovascular Study. Lamarche B, Lemieux S, Dagenais GR, Després JP. Growth Horm IGF Res. 1998 Apr;8 Suppl B:1-8. Review. 7. Is lipoprotein(a) an independent risk factor for ischemic heart disease in men? The Quebec Cardiovascular Study. Cantin B, Gagnon F, Moorjani S, Després JP, Lamarche B, Lupien PJ, Dagenais GR. J Am Coll Cardiol. 1998 Mar 1;31(3):519-25. 8. Low-density lipoprotein subfractions and the long-term risk of ischemic heart disease in men: 13-year follow-up data from the Québec Cardiovascular Study. St-Pierre AC, Cantin B, Dagenais GR, Mauriège P, Bernard PM, Després JP, Lamarche B.
Arterioscler Thromb Vasc Biol. 2005 Mar;25(3):553-9. 10. Epigenetic oxidative redox shift (EORS) theory of aging unifies the free radical and insulin signaling theories. Exp Gerontol. 2009 Nov 26. 12. A low carbohydrate, high protein diet slows tumor growth and prevents cancer initiation. Cancer Res. 2011 Jul 1;71(13):4484-93. 13. Resistance exercise reverses aging in human skeletal muscle. Melov S, Tarnopolsky MA, Beckman K, Felkey K, Hubbard A.
PLoS One. 2007 May 2;2(5):e465. Been reading all your posts...you've been on quite a journey haven't you? Funny how we ended up in the exact same place after chasing lots of false leads. Oh well - we have the rest of our lives to get it right! High insulin is bad but low low low insulin is bad too. That was me. Yup when I tried to 'keto adapt' to vlc and doing endurance events. Keeping my insulin HIGH for about 6 months cured that (and had to gain 10 lbs). The adrenals hate ludicrously low blood glucoses I found out!! I like ending up where we are. It's a happy place. I'm grateful for the eyes of perception that I've hard earned... Dont you?